3 bedroom/1 bath Lake home with Private covered dock. Enjoy sunrise in the morning and shaded deck at sunset. FIR PIT. Only a few steps from deck to dock. Open living and kitchen. Views of lake from all rooms except bath. Very clean rental property. Direct TV in living and master. WIFI. All you have to do is bring your food and clothes. After a long day on the lake enjoy the shaded deck or the fire pit both overlooking the lake. We enjoy all water sports including scuba diving. Passion is to one day own a corporate retreat. Family has owned lake property since the early 1950's. Still Owner in the original family cabin at Ha Ha Tonka. Enjoy roasting hot dogs about the new fire pit. Relax in the evening about a camp fire and enjoy the view of the lake. Only two miles from Ozark Amphitheatre and 15 minutes by boat or car to HA HA TONKA. 40" flat screen in LR and 32" flat screen in master bedroom. Covered private Boat Dock with 6000 lb lift for pontoon or run about boat, Slip on dock is 10' - 6' wide x 32'-0' long. 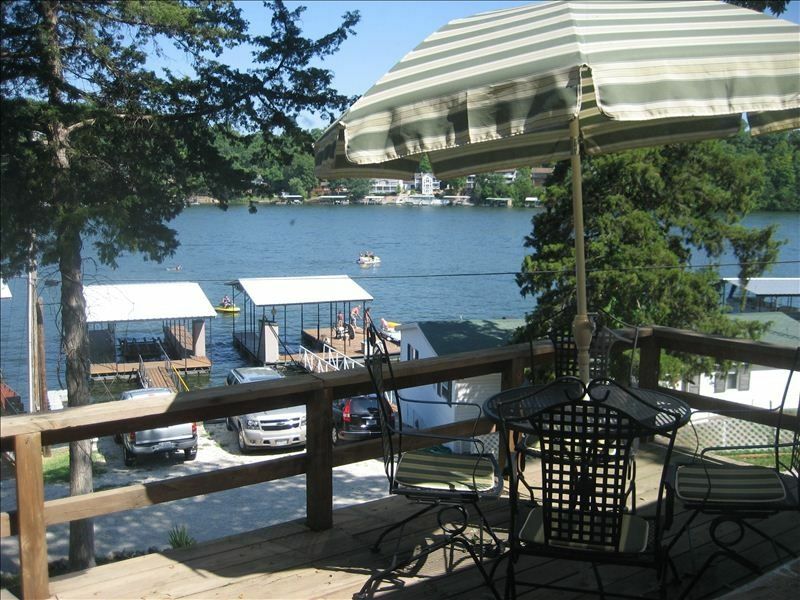 Public boat access nearby, Quiet location on the water, Deck on east side of house, Short boat drive to HA HA Tonka and Bridal Cave, Paved roads to house. Only 2 miles from Ozark Ampitheatre. Only vacation rental in the neighborhood. The house was perfect for five of us. We thoroughly enjoyed our stay. And the owner was extremely helpful. We enjoyed our stay here :) Pat and Jim were very nice and checked in to make sure all was good. Nice clean place and boat lift was an added bonus! We had a great stay in this little lake house! Everything was exactly as promised! Quiet neighborhood, clean house and great view of the lake! Check in and out was a breeze! We would stay here again. We had a wonderful time enjoying Pat's Lakeside get away. Pat made sure that we had everything we needed to enjoy our stay. The house is well-stocked, and you really don't need to bring anything with you except food and your clothes. The neighborhood where her home is situated is very quiet. The neighbors are kind and welcoming, and we even enjoyed the company of a local dog, Sheeba, who accompanied us each morning on our walk. Our first morning there, Pat stopped by with the most delicious box of donuts. Not something we would normally treat ourselves to, but we ate every last one of them. She provided us with some wonderful suggestions of places to visit in the area. If you decide to stay at her place, Ha Ha Tonka should be at the top of your list of places to go and visit. What a treat! If we come back to the area, we will definitely consider staying at her place again. Pat was an excellent hostess. The house was clean and equipped with everything you could ever need. We had a great time. Will be back for sure. House was clean and well equipped. Pat was very nice and helpful. Dock was in good shape and worked well. Rates are subject to change until reservation is confirmed. Holidays require full week rental. One week rental is 6 nights and seven days.